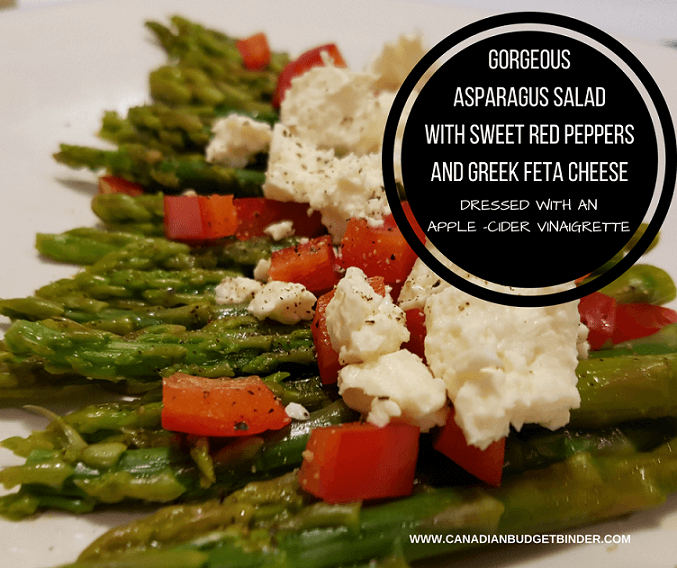 A vibrant green fresh asparagus salad with sweet red peppers and Greek feta cheese dressed with an apple cider vinaigrette will wow you and your guests. The best part is that the asparagus salad is low carb and easy as pie to make. Well, easier than pie I should say. When you are hosting a party this Spring or Summer take advantage of fresh asparagus that are in abundance and fairly inexpensive to purchase. Since asparagus is stocked at the grocery stores keep an eye out on the reduced rack as you may get lucky and score a great deal on seconds. Around May, June and into July asparagus are in season in Ontario and you can find asparagus growing in many ditches along country roads where vegetable farms reside. This is the time you may find foragers out and about with their bags and a sharp knife scooping up their free produce. We’ve done this many times in the past with the family and it was quite fun. My father-in-law is a master forage ranger as he started with his parents back in Europe as a child. What happens is the seeds of the asparagus blow in the wind and scatter tend to grow best in areas where water levels are able to sustain their growth. Once the seeds are planted or if you garden them yourself it will take a few years for growth but once it starts you will be blessed for 20-30 more years to come. This is why when we forage we go back to the same spots each year as we know there will be more asparagus to be found. The key is to get there before the other foragers do because they too know the hot spots. If foraging is not your thing you can purchase bundles of asparagus at the grocery store or at local farms in your community that sell produce. Foraging is fun, educational and certainly an experience we should all have and learn about. We will be exploring this with our son as he gets older and understands what is happening. We eat asparagus just about any way we can but one of our favourite dishes is an elegant, fresh asparagus salad with feta cheese. Most people might not think to spruce up their asparagus with a vinaigrette and serve this as a side-dish but it works, it really does. 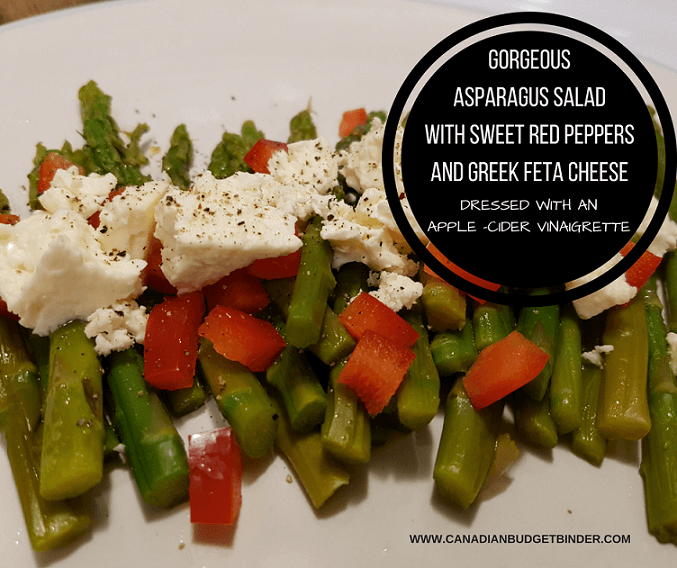 Any time we make our asparagus salad we like to add bits of gorgeous red pepper and top it with Greek feta cheese. You could also use Parmigiano cheese or blue cheese but sticking to a stronger cheese to bring out the flavours of the asparagus salad is ideal. The vinaigrette is a simple apple cider vinegar and extra virgin olive oil mix with salt and pepper. Some of you may even want to add finely chopped garlic to the dressing if you fancy a bit more punch in your asparagus salad. Your guests will not only think it’s the best salad they’ve had in a long time but it’s refreshing to see a salad other than a greens salad on the dinner table. Serve the asparagus salad cold with BBQ steak or any other protein you fancy and can call it a meal. If you can do those two things above you’re on easy street to make this asparagus salad. 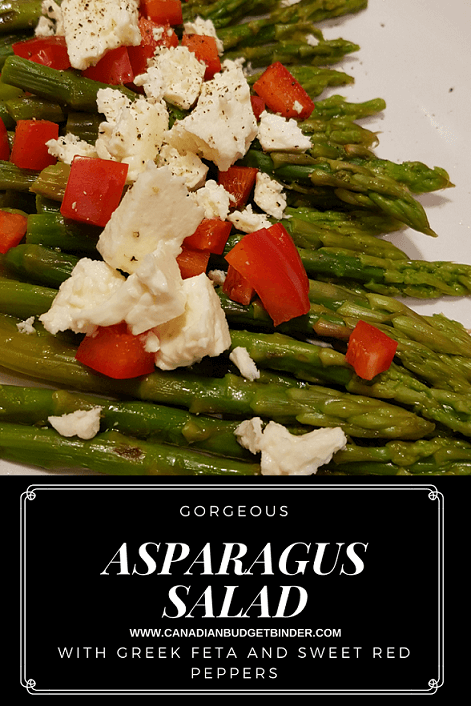 Asparagus salad is the perfect Spring or Summer side-dish that is inexpensive to make and looks pretty awesome on any dinner or party table. Snap the bottoms off naturally or cut them with a knife. This is to prevent any old stalk from making it into your dish as it is too chewy. In a large skillet with a lid add a ½ cup of cold water, asparagus, pinch of salt and cover on high heat for approx 7 mins. I test along the way for crunchiness so I don't over-cook. It depends on the size of the asparagus but since they are all different keep an eye on them. Once done drain any water in the pan and put the asparagus immediately into an ice bath to cool and retain colour. In the meantime you can chop your sweet red pepper into small pieces and crumble your feta. In a small mason jar add apple cider vinegar, extra virgin olive oil, salt and pepper then shake, shake, shake. Line the asparagus on a pretty serving platter, top with red pepper and feta then pour the dressing over. You see a delicious salad doesn’t have to take forever to make so if you’re in a pinch for something to bring to a BBQ party this summer this asparagus salad is it. Print or save a copy, you won’t regret it. Per entire Recipe 6 servings: Net Carbs -16.5g, Fat 131g, Protein 31g, *Using Atkins Carb Counter /Total Carbs 16.5g or 2.75g per serving. Please share this recipe with your friends if you think they might like it and please leave a review and tell me what you think. You can also pin the recipe on Pinterest and share on just about every social media outlet. Big Thanks. Enter your email address on the home page to SUBSCRIBE to my blog. Once you subscribe you will be sent an email from me immediately. The reason is that you need to approve the subscription in order to start receiving my daily blog post.